Pick Analysis: After playing three seasons of high school basketball, Anderson joined the football team for his senior year. He was the conference's defensive player of the year in that lone season, but still slipped through the recruiting cracks a bit. 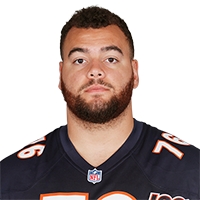 The cousin of former Penn State and current Tennessee Titans defensive tackle Austin Johnson signed with Bucknell and he's made the All-Patriot League team every season. Anderson was a second-team pick in 2014, starting 11 games (28 tackles, three for loss) and made the first of three first-team appearances as a sophomore (46 stops, eight for loss, 4.5 sacks). Anderson led the Bison with 13.5 tackles for loss in 2016 (55 total), including 8.5 sacks, while also breaking up five passes and blocking two kicks. He began getting national honors in 2017, receiving second-team FCS All-American notice after recording 42 tackles, nine for loss, and 2.5 sacks as a senior. His first-team All-Patriot League honors allowed him to join 2017 fourth-round pick Julien Davenport as four-time all-conference performers at Bucknell.